"The majority of California Indian languages belong either to highly localized language families with two or three members (e.g. Yukian, Maiduan) or are language isolates (e.g. Karuk, Esselen)." Of the remainder, most are Uto-Aztecan or Athapaskan languages. Larger groupings have been proposed. The Hokan superstock has the greatest time depth and has been most difficult to demonstrate; Penutian is somewhat less controversial. There is evidence suggestive that speakers of the Chumashan languages and Yukian languages, and possibly languages of southern Baja California such as Waikuri, were in California prior to the arrival of Penutian languages from the north and Uto-Aztecan from the east, perhaps predating even the Hokan languages. Wiyot and Yurok are distantly related to Algonquian languages in a larger grouping called Algic. The several Athapaskan languages are relatively recent arrivals, no more recent than about 2000 years ago. A map locating the main tribes native to California (before Europeans' arrival). The Spanish began their long-term occupation in California in 1769 with the founding of Mission San Diego de Alcalá in San Diego. The Spanish built 20 additional missions in California. Their introduction of European invasive plant species and non-native diseases resulted in unintended havoc and high fatalities for the Native Californian tribes. Most of inland California including California deserts and the Central Valley was in possession of the local tribes until the acquisition of Alta California by the United States. As the wave of immigrants from the United States started to settle inland California during the Gold Rush, conflicts between the Native Californians and the immigrants started to arise. The series of massacres, battles, and wars between the United States and the indigenous peoples of California lasting from 1850 to 1880 is referred to as the California Indian Wars. Throughout the 20th century, the population of indigenous peoples of California gradually rose. 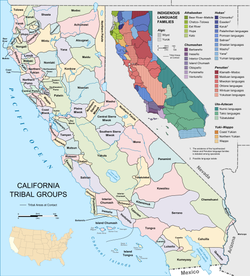 According to the National Conference of State Legislatures, there are currently over one hundred federally recognized native groups or tribes in California including those that spread to several states. Federal recognition officially grants the Indian tribes access to services and funding from the Bureau of Indian Affairs, and Federal and State funding for Tribal TANF/CalWORKs programs. Basket making was an important part of Native American Californian culture. Baskets were both beautiful and functional, with a wide variety of shapes and sizes based on their function, and of different patterns. Baskets were generally made by women. In Southern California the Toloache religion was dominant among tribes such as the Luiseño and Diegueño. Ceremonies were performed after consuming a hallucinogenic drink made of the jimsonweed or Toloache plant ( Datura meteloides), which put devotees in a trance and gave them access to supernatural knowledge. Native american culture in California was also noted for its rock art, especially among the Chumash of southern California. The rock art, or pictographs were brightly colored paintings of humans, animals and abstract designs, and were thought to have had religious significance. ^ "Historic Tribes of the Great Basin - Great Basin National Park (U.S. National Park Service)". Nps.gov. Retrieved 2018-02-04. ^ Codding, B. F.; Jones, T. L. (2013). "Environmental productivity predicts migration, demographic, and linguistic patterns in prehistoric California". Proceedings of the National Academy of Sciences. 110 (36): 14569. doi: 10.1073/pnas.1302008110. PMC 3767520. PMID 23959871. ^ Neil G. Sugihara; Jan W. Van Wagtendonk; Kevin E. Shaffer; Joann Fites-Kaufman; Andrea E. Thode, eds. (2006). "17". Fire in California's Ecosystems. University of California Press. p. 417. ISBN 978-0-520-24605-8. ^ a b Cunningham, Laura (2010). State of Change: Forgotten Landscapes of California. Berkeley, California: Heyday. pp. 135, 173–202. ISBN 1597141364. ^ "Alaska and California in the Eighteenth Century - Jonathan's Guide to US History". Jonathan-guide.neocities.org. Retrieved 2018-02-02. ^ Herrera, Allison (December 13, 2017). "In California, Salinan Indians Are Trying To Reclaim Their Culture And Land". Npr.org. All Things Considered. Retrieved 26 March 2018. ^ a b "INDIANS of CALIFORNIA - American Period". Cabrillo.edu. ^ "The Treaties Secret With California's Indians" (PDF). Archives.gov. Retrieved 3 December 2018. ^ Tina Norris; Paula L. Vines; Elizabeth M. Hoeffel. The American Indian an Alaska Native Population: 2010 (PDF). U. S. Census Bureau. Retrieved 2018-03-04. ^ "Top 5 Cities With The Most Native Americans - Indian Country Media Network". Indiancountrymedianetwork.com. Retrieved 2018-02-04. ^ Legislatures, National Conference of State. "List of Federal and State Recognized Tribes". Ncsl.org. Retrieved 3 December 2018. ^ "Native Americans: Pre-Columbian California to 18th Century". Calisphere.org. ^ "Kuksu Cult". Web.archive.org. 11 October 2006. Retrieved 3 December 2018. ^ Kroeber, Alfred L. The Religion of the Indians of California, 1907. ^ "California Indian - people". Britannica.com. Golla, Victor (2011). California Indian Languages. Berkeley: University of California Press, . ISBN 978-0-520-26667-4. Heizer, Robert F., volume editor (1978). Handbook of North American Indians, Volume 8: California. Washington, DC: Smithsonian Institution. ISBN 978-0-16-004574-5. Hinton, Leanne (1994). Flutes of Fire: Essays on California Indian Languages. Berkeley: Heyday Books. ISBN 0-930588-62-2. Hurtado, Albert L. (1988). Indian Survival on the California Frontier. Yale Western Americana series. New Haven: Yale University Press. ISBN 0300041470. Lightfoot, Kent G. and Otis Parrish (2009). California Indians and Their Environment: An Introduction. Berkeley: University of California Press. ISBN 978-0-520-24471-9. 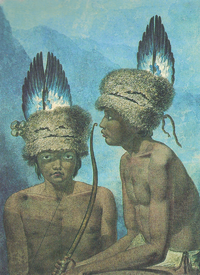 Wikimedia Commons has media related to Native Americans of California. Shea, John G. (1879). "California, Indians of" . The American Cyclopædia.